Many thanks to flutist Ron Korb for showing my film "Sister of the Wind" during his performance at the opening program for the exhibition Being Japanese Canadian, Reflections on a Broken World at the Royal Ontario Museum in Toronto last night. Ron did a live performance of the musical score he composed for the film. The film includes sound design by Steve Munro and was made with funding by the Toronto Arts Council. My animated film "Emanations: A Visual Poem" (2017) screened on Thursday, Jan. 31, 2019 at 7:30 p.m. at the Particle + Wave Media Arts Festival in Calgary, Alberta. The film has music by Paul Intson, and was made with funding from the Ontario Arts Council. Thanks to Winnipeg Film Group Distribution. 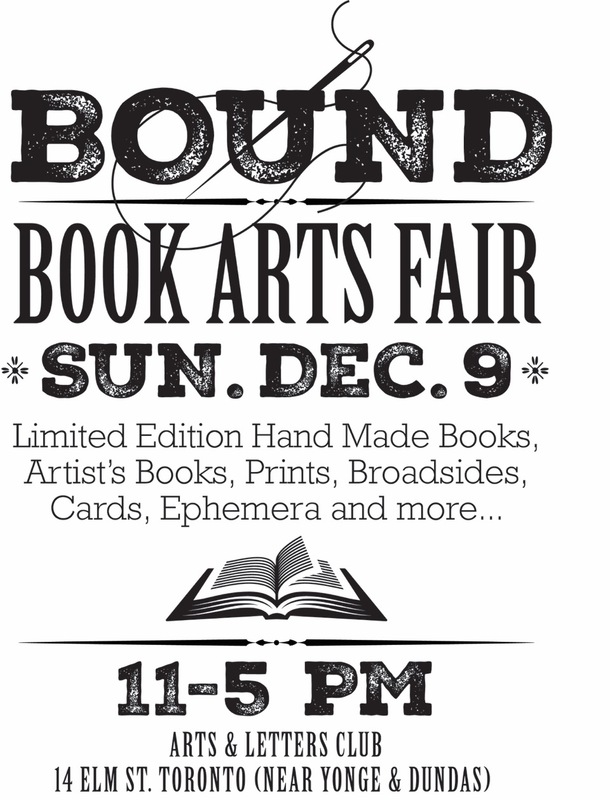 On Sunday, December 9, 2018, I was at the Bound Books Arts Fair from 11 to 5 p.m. selling my flip books and books. The event was at the Arts and Letters Club, 14 Elm Street, Toronto. Thanks to everyone who dropped by my booth and bought my books! It was a good show! My recent film "Sister of the Wind" will be shown at the 15th Animateka International Animation Festival in Ljubljana, Slovenia in December. Thanks to the Toronto Arts Council for funding this film. It was made in collaboration with flutist Ron Korb, who composed and performed the musical score and calligraphy by Rita Ip, with sound design by Steve Munro, and production assistance by Jade Yeh. A big thanks to the Toronto Japanese Film Festival 2018 for screening my film "Sister of the Wind" in their latest edition. The event took place at the Japanese Canadian Cultural Centre in Toronto. The musical score for the film was written and performed by Ron Korb, with calligraphy by Rita Ip, production assistance by Jade Yeh and sound effects by Steve Munro. Special thanks to the Toronto Arts Council for funding the film. I really appreciate it. "Sister of the Wind" in Portugal! Great news! 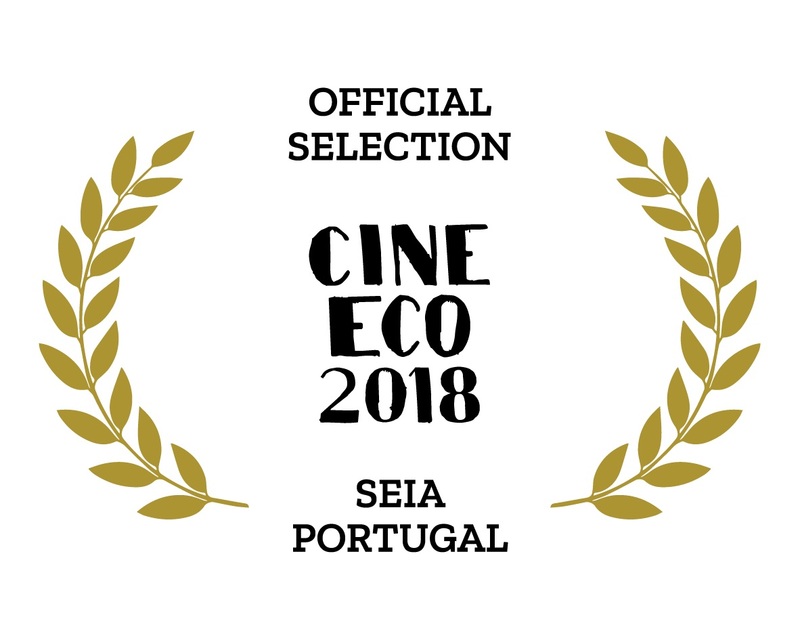 My film "Sister of the Wind" is an Official Selection in the Short Films International Competition at CineEco 2018 - 24th Serra da Estrela International Environmental Film Festival in Seia, Portugal. The festival runs from the 13th to the 20th of October. It's an honour to have Sister in this ecological festival as it is about nature and Asian culture. 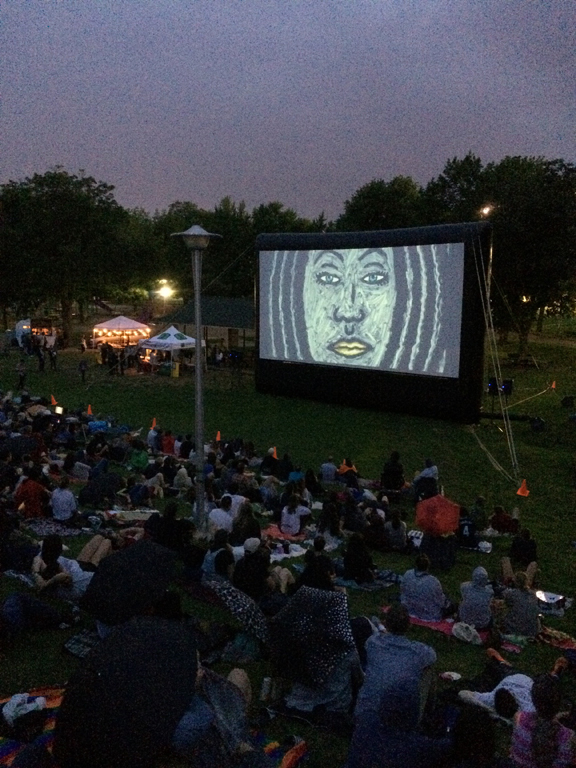 The film was made in collaboration with flutist Ron Korb, who composed and performed the musical score and calligraphy by Rita Ip, with sound design by Steve Munro, and production assistance by Jade Yeh. I'm really pleased! 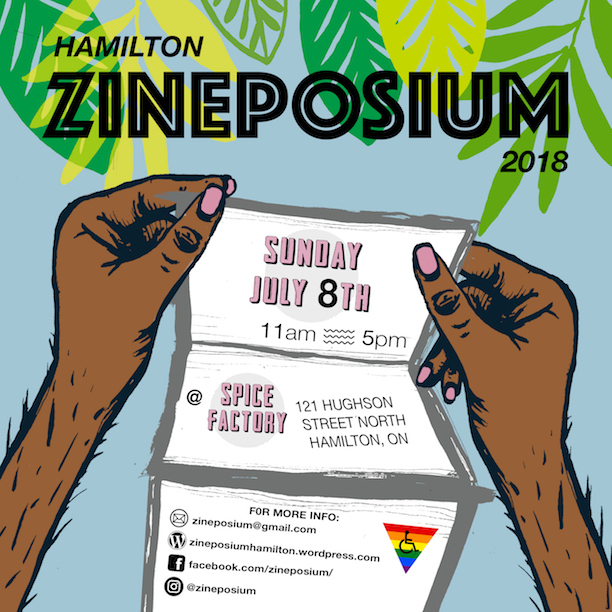 On Sunday, July 8, I was selling my "Book of Dreams", zine and flip books at the Hamilton Zineposium 2018 at The Spice Factory, 121 Hughson Street North in Hamilton, Ontario. 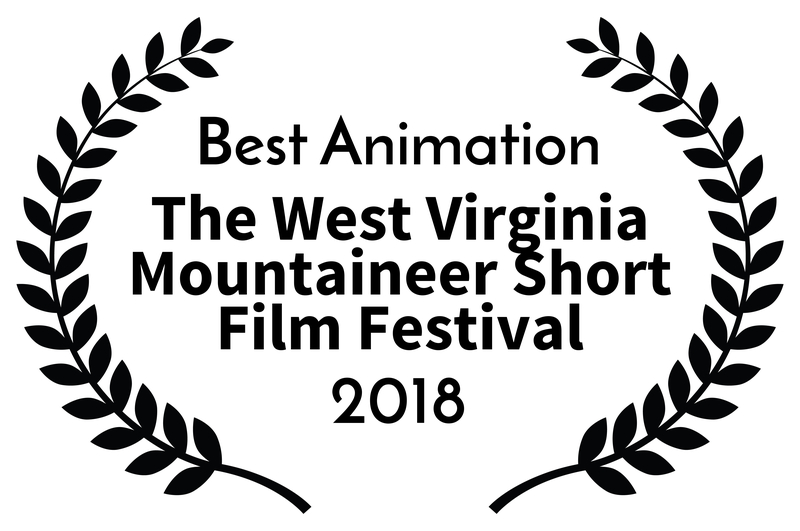 My film, "Emanations: A Visual Poem", won the Best Animation Award at the 2018 West Virginia Mountaineer Short Film Festival! I'm very pleased. Thanks to Steph Berrington at Winnipeg Film Group Distribution for entering the film in the festival. Thanks as well to Paul Intson who composed and performed the musical score for the film. Thanks also to the Ontario Arts Council for funding the film. 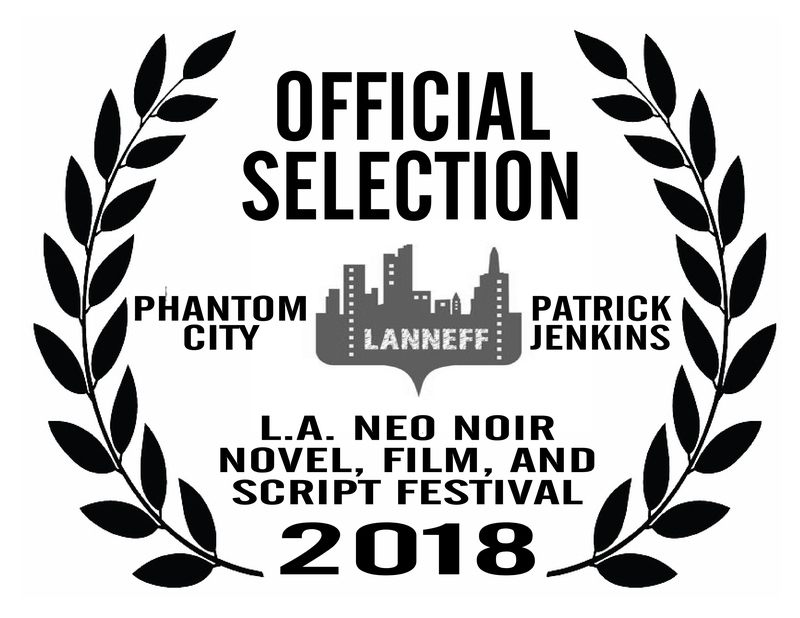 My 2015 film "Phantom City" was nominated in the Best Picture Category of the 2018 L.A. Neo Noir Novel, Film and Script Festival which took place in Los Angeles on May 26, 2018. 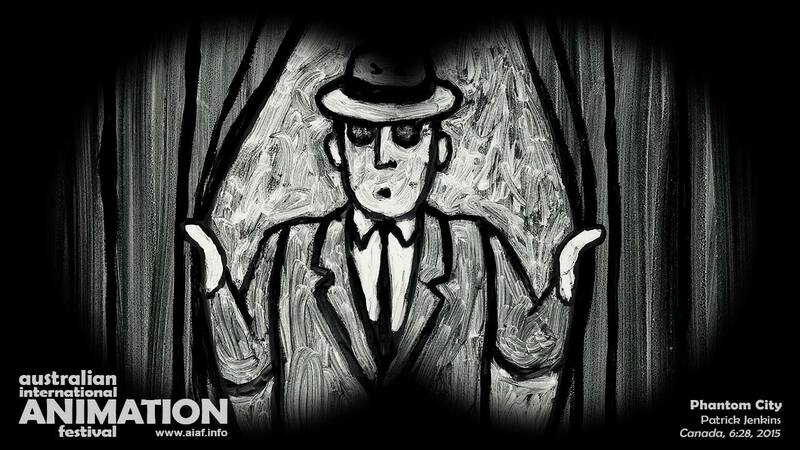 I am very pleased to have my animated noir film chosen for this festival. Thanks to the Canada Council for the Arts for funding the film and to Paul Intson who composed the music and did the sound mix and Steve Munro who did the Sound Design. 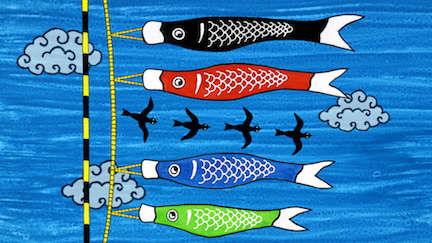 An animated film about the relationship between the wind and the flute, and Asian culture, made in collaboration with Grammy nominated flutist Ron Korb. October 2017: Japan National Tourist Organization Youth Concert, River Rock Theatre, Richmond B.C. February 2018: Animac, Mostra Internacional de Cinema d’Animaci� de Catalunya, Lleida, Spain. October 2017: Transient Visions: Festival of the Moving Image, Johnson City, NY, U.S.A.
April 2018: West Virginia Mountain Film Festival, Morgantown, West Virginia, U.S.A.
May 2018, Best Picture Nominee, L.A. Neo Noir Film Festival, Los Angeles, California, U.S.A.
From July 17, 2017 - July 31, 2017 my film "Circle Game" was in Streetlight, a series of projections in the window of the Roman Susan Gallery, 1224 West Loyola Avenue, Chicago, Illinois, U.S.A. Thanks to Tracy Miller-Robbins, who also has a piece in this exhibition, for all her help. 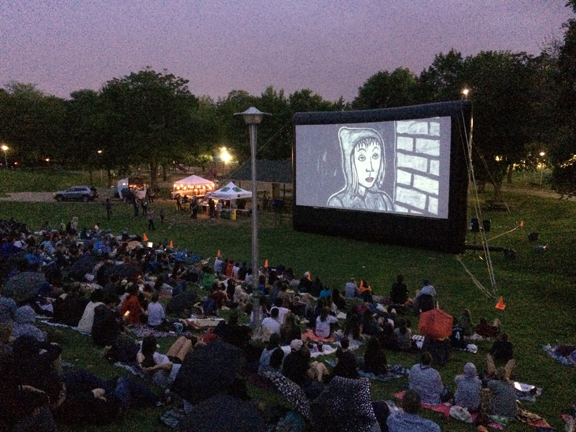 On Sunday, July 9, 2017, my short animated noir film "Phantom City" was shown at the Christie Pits Film Festival in Toronto. The film was shown along with the noir classic "The Maltese Falcon" Thanks to the Toronto Outdoor Picture Show for showing my film in this programme! Thanks as well to the Canada Council for the Arts for funding the film and Paul Intson for composing the musical score and mixing the film. My film "Phantom City" will also screen in the Short Film Competition at the 2017 Santiago del Estero Film Festival, Festival Internacional de Cine Independiente in Argentina from July 11 to 15th. Thanks to Pichu Tomsic and the festival staff for selecting my film! 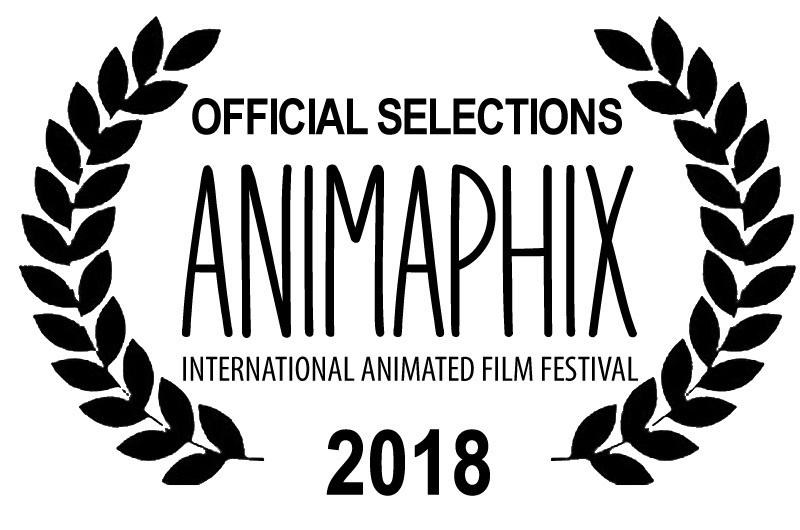 "Emanations" screened at the Melbourne International Animation Festival in Melbourne, Australia. The festival runs from June 18 to 25, 2017. I'm pleased to announce that I recently completed a new film, "Emanations: A Visual Poem". It's a short abstract movie about the relentless cycle of life, including growth and decay, wonder and awe. I sold my flip books and chap books at the 2016 Ontario College of Art and Design University Book Arts Fair, 100 McCaul Street, Toronto, on Saturday, December 10 from 10 a.m. to 5 p.m. I sold my flip books and chap books at the 2016 Canzine Festival of Zine Culture and the Independent Arts at the Art Gallery of Ontario, Toronto, on Saturday, October 29, 2016. Toronto Premiere of Phantom City! My latest film "Phantom City" had its Toronto premiere in the screening "Time Form Scene" on October 13 at Cinecycle in Toronto. It was also shown at the Animated Dreams Festival in Tallinn, Estonia from Nov. 16 to 20, 2016; the Stoptrik International Film Festival in Maribor, Slovenia which ran October 27 to 30th, 2016 and the Reggio Film Festival in Italy; the 2016 Anima Mundi International Animation Festival in Rio de Janeiro and Sao Paulo, Brazil in Oct. and Nov. 2016; the Anim’est International Animation Festival, Bucharest, Romania in October 2016, the London International Animation Festival, England in December. 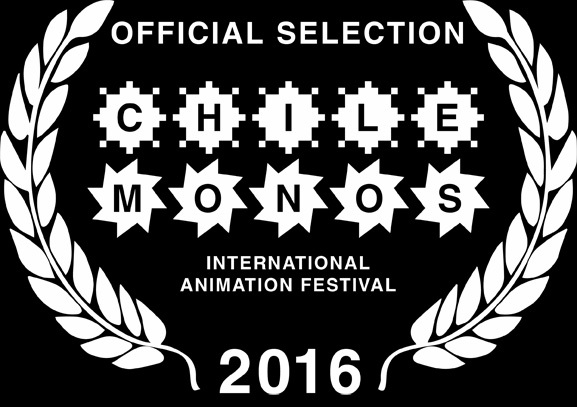 It was also screened at the XI International Competition for Animated Short Film of ANIMASIVO, Mexico City Contemporary Animation Festival; the 2016 Canterbury Anifest, England; the 2016 Ottawa International Animation Festival in Ottawa, Ontario, Canada; and the Lowlands Festival in the Netherlands. I'm in a documentary made by Cecilia Traslavi�a from Bogota, Colombia called Pertpetuum Mobile Chapter 2. "Creative processes". Here is the link. https://www.youtube.com/watch?v=x6znY_TCRB4. My interview is at the 24:25 minute mark. Thanks to Cecilia for including me in this movie. 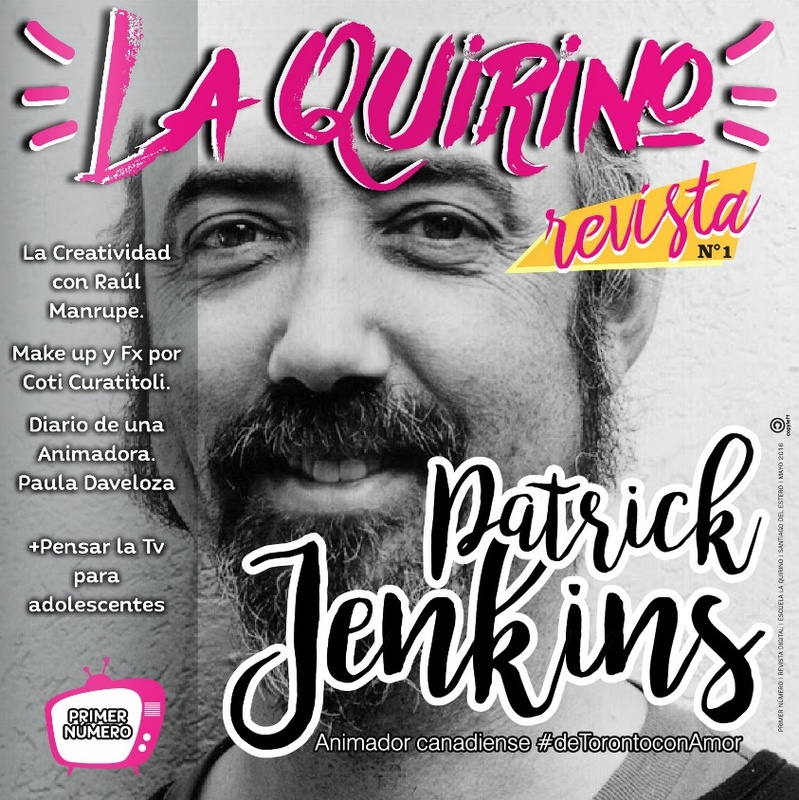 Recently I was interviewed by Pichu Tomsic for La Quirino, a new online Spanish language animation magazine from Argentina. 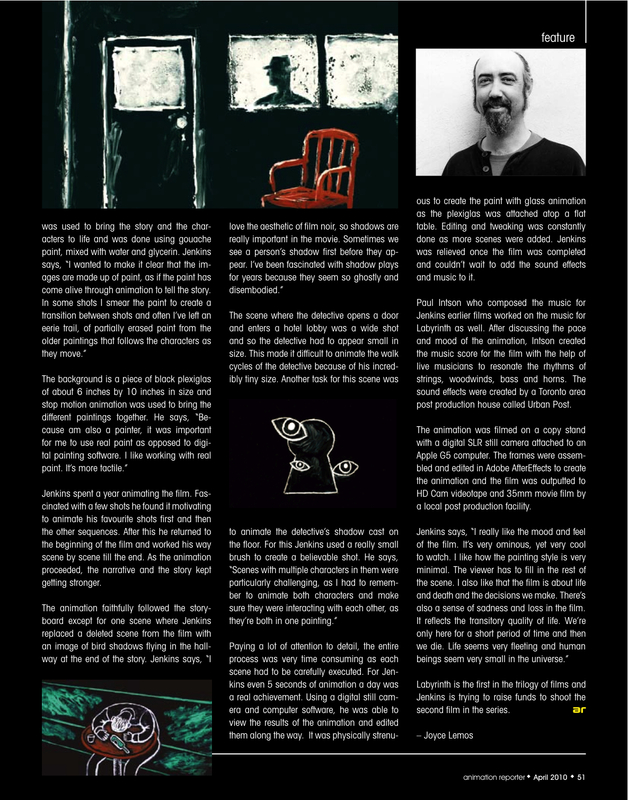 Thanks to Pichu Tomsic for interviewing me and reproducing stills from my recent film “Phantom City” to illustrate the article. 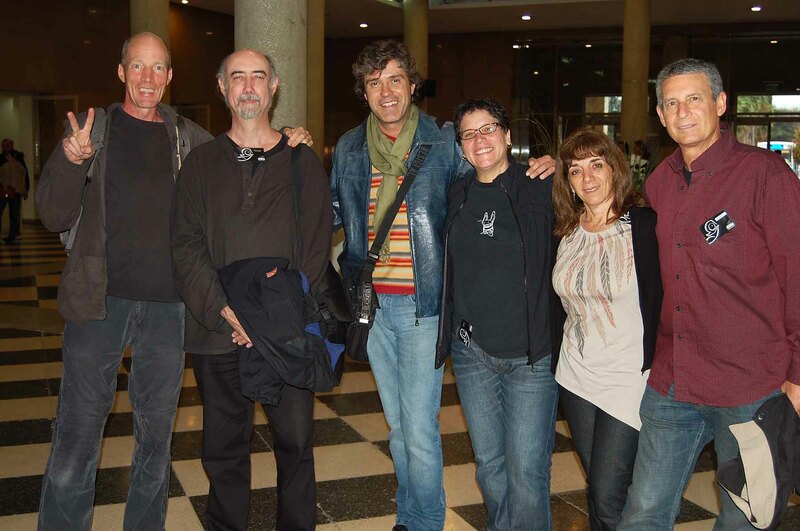 In 2011, I was a special guest artist, at Anima VI, the C�rdoba International Animation Festival, in C�rdoba, Argentina. On Saturday, April 30, 2016, from 9 a.m. to 5 p.m. I was at the Wayzgoose Book Arts Fair in Grimsby, Ontario. This year I have 3 classic flip books back in print: "Play Ball!" (about baseball), "Out of this World" (about an alien) and "A Fishy Tale" along with a perfect bound edition of my recent flip book "Morphing City Hall" and "Slap Shot!" and "In the Wink of an Eye"! 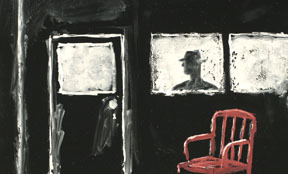 Here's the catalogue description: "A hand-painted opus laced with noir. A woman with a mysterious suitcase and a man in pursuit - just one of the tales in the Phantom City". "In a big city a young woman sees a movie called “Naked Angels”. What appears to be a film noir is actually a passage through the fourth wall. This beautiful game with reality does what only animation can. A nice jazzy score is a binding element in a sequence of bizarre twists." I toured Western Canada, showing my films and conducting workshops in animation. 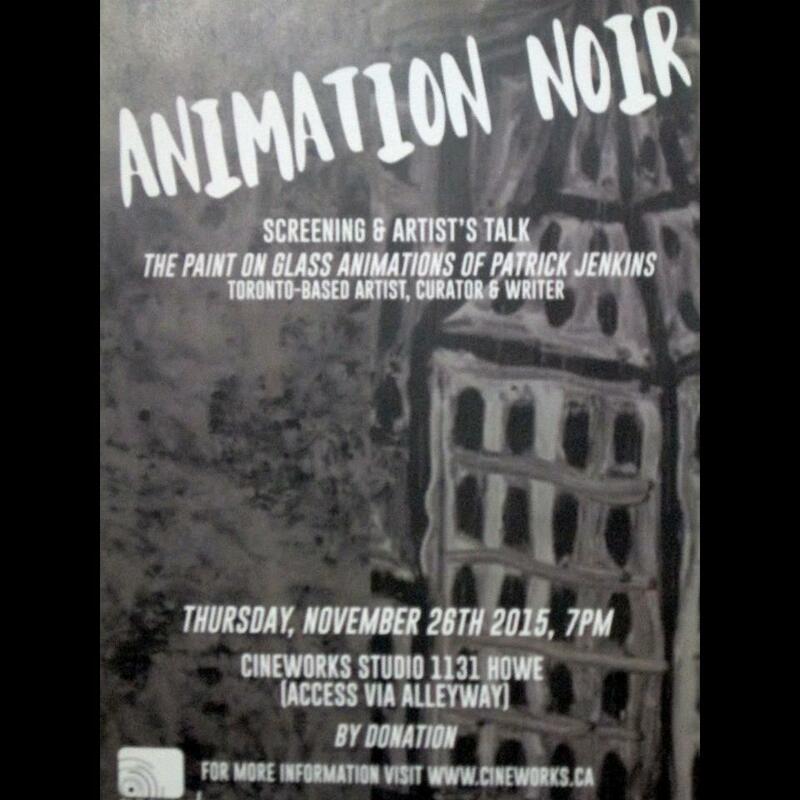 Nov. 26, Cineworks, Howe Street Studio, Vancouver, B.C. 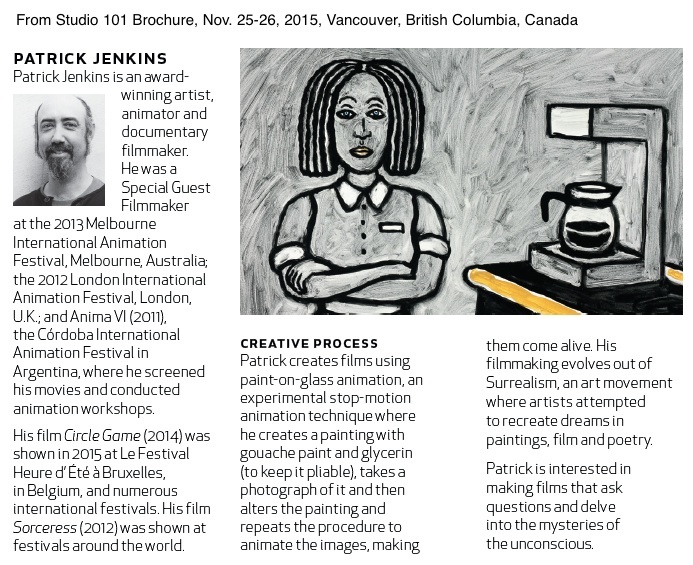 Nov. 27, Emily Carr University of Art + Design, Vancouver, B.C. Nov. 30, University of Victoria, Victoria, B.C. Dec. 1, MediaNet, Victoria, B.C. Thanks to the Canada Council for the Arts, Media Arts Section, for travel funding. Phantom City Trailer from Patrick Jenkins on Vimeo. I recently completed a new film entitled "Phantom City". 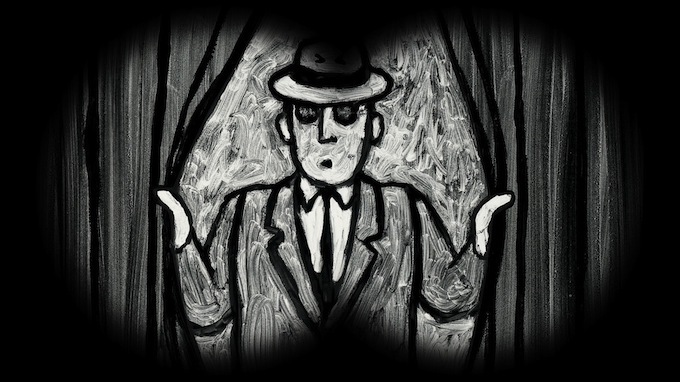 It's a 6.5 minute, paint on glass animated film, part magic realism, part film noir. Thanks to Paul Intson for the fabulous musical score and mix and thanks to Steve Munro for the great sound effects. I was working on this film for the past 2.5 years. Thanks to the Canada Council for the Arts for funding this movie. "Phantom City" will have its premiere at the 14th edition of the Sommets du cin�ma d'animation, an animation festival at Cinematheque Quebecoise in Montreal from November 25th to 29th 2015! 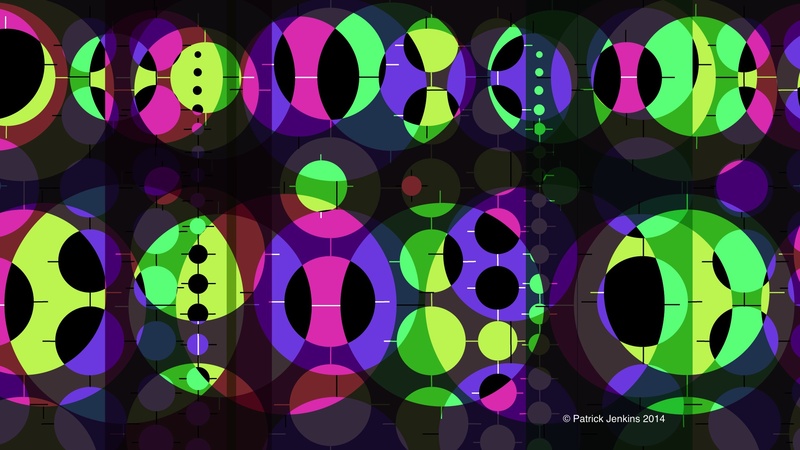 My new film "Circle Game" is "A magical dance of circles which becomes an abstract movie through superimposing two drafting templates, resulting in chance animation." Feb 2015 at the Animex International Festival of Animation and Computer Games in England. July 2014 Toronto Animated Image Society Showcase on July 2014. I was at the 2014 and 2015 editions of the Wayzgoose Book Arts Fair at the Grimsby Public Art Gallery selling my flip books, chap books and dvds. Sat. Nov. 30, 2013 I was at the OCAD Book Arts Fair, 100 McCaul Street with my chapbooks, dvds for sale! My "Labyrinth" was screened at the 2013 London International Animation Festival on October 26 at the Horse Hospital in London, England in the Canadian Indie Showcase. LIAF describes my film as "A surrealist, film-noir paint-on-glass epic following a detective’s strange encounters with mysterious phenomena from the dark-side." I had a great day at Toronto's Word On The Street yesterday, Sunday, September 22, 2013, selling my dvds, flip books and chap books. Our booth title "Cemetery Photographs & Flip Books" got us a mention in the Toronto Star Newspaper. The name definitely drew people to our booth. My 2008 film "Labyrinth" was screened in Lima, Peru as part of a selection of short films by Toronto Animated Image Society members at the Filmo Corto Festival 2013 (Aug 6 - 8). Thanks to Madi Piller at TAIS for including my film in the screening. 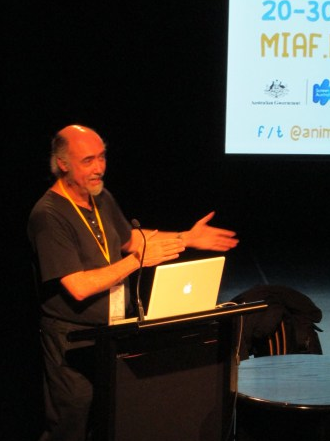 I was honoured to be a Special Guest Filmmaker at the Melbourne International Animation Festival 2013 in Melbourne, Australia from June 20th to June 30th, 2013. I had a great time. It was a wonderful festival. Many thanks to Festival Director Malcolm Turner and Festival Manager Helen Gibbins for all their hospitality. You can read about my adventures in Melbourne on my blog. I helped Festival Director Malcolm Turner curate and introduce a series of 3 Programs of Canadian Independent Animation. My films"Sorceress", "Amoeba" and "Labyrinth" were shown in these Programs. I was honoured that my film "Labyrinth" was also shown in the MIAF Gala Opening Screening. 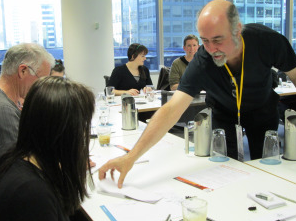 As if that wasn't enough, I also ran a Flip Book Movie making workshop with 20 excellent participants. I was also on the jury that selected the Best Australian Film of the Festival. I also visited the Animation Department in the School of Film and Television at the Victorian College of the Arts, at the University of Melbourne where I met with the Lecturer Paul Fletcher and Lecturer Robert Stephenson and chatted with their students about their work in progress. On Saturday April 27, 2013, I was at the Wayzgoose Book Arts Festival at the Grimsby Public Library and Art Gallery, selling my dvds, chap books and flip books. Sold 37 flip books and 3 chap books. Thanks everyone! 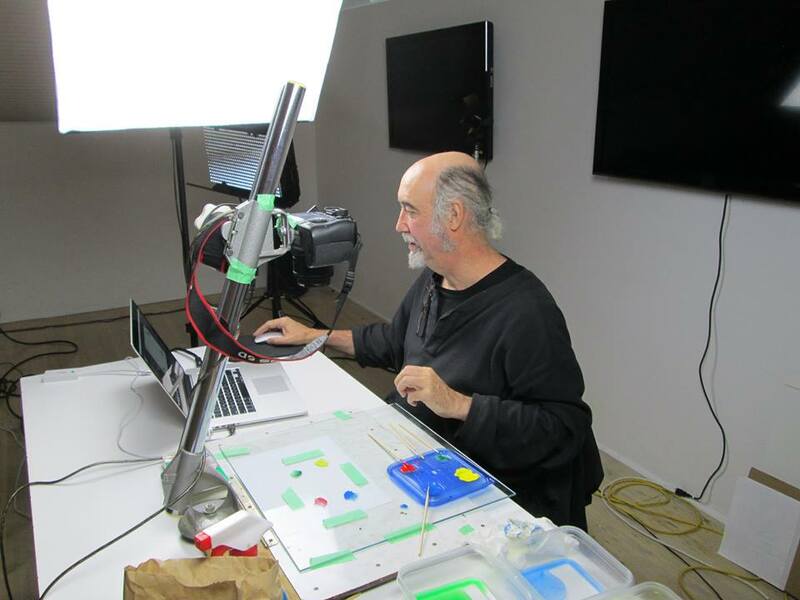 April 9, 2013: I evolve my paint on glass animation through a series of tests or experiments. Here's a very short silent clip I did last week of the metamorphosis of a man into a bird. It's done with a mixture of gouache, glycerin, and water on a white linoleum surface, adding and removing paint between the frames. Sometimes these experiments evolve into longer films. My latest film "Sorceress" was shown at the LAMPS Film Festival on April 10th and 11th in Lethbridge, Alberta. I was recently awarded a Research/Creation Grant from the Media Arts Section of the Canada Council for the Arts to develop a new movie project. I'm pleased to announce that I've been invited to attend the Melbourne International Animation Festival in Melbourne, Australia from June 23 to 30, 2013 as a guest filmmaker. Thanks to Festival Director Malcolm Turner for organizing this invitation. I really appreciate it. 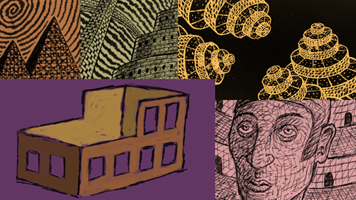 He's curating a series of screenings on recent Canadian Independent Animation for MIAF 2013. I've been helping him a little with research for this series. More details will be coming soon. 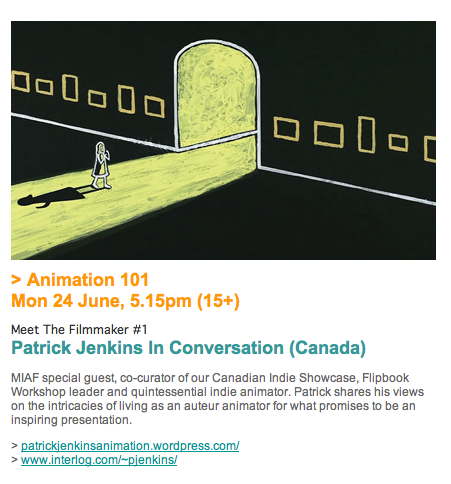 While I'm in Melbourne, I'll be leading a workshop on flip book animation and speaking about Canadian Independent Animation. I appreciate all the support MIAF and its sister festival the London International Animation Festival (which I attended in Oct. 2012), have given my work over the years. My films "Labyrinth", "Inner View" and "Sorceress" have screened at both Festivals. Thanks to Charles Wilson at Smudge Animation for the great interview. A half-hour video interview I did about my work is now up at the Canadian Animation Blog. Thanks to Grayden Laing at Canadian Animation Blog. On Sat. December 15th, I was at the Bazaar of the Bizarre: Frost Bite!, 918 Bathurst Street, Toronto, selling my dvds, books and flipbooks. and the Istanbul Animation Festival in Turkey. 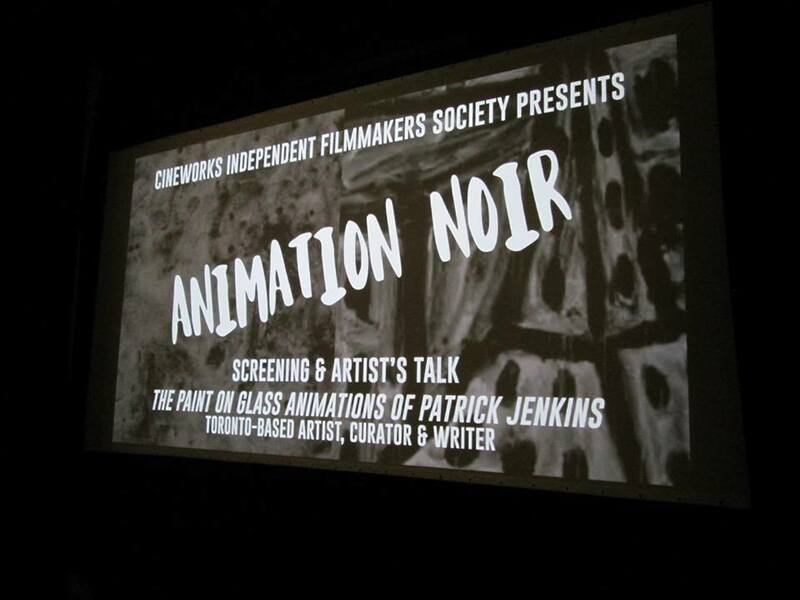 Now available for order DVD: "Animation Noir: Films By Patrick Jenkins"
I'm pleased to announce the release of my dvd "Animation Noir: Films By Patrick Jenkins". It includes all my recent paint on glass animated films: Sorceress (2012), Labyrinth (2008), Amoeba (2012), Inner View (2009), Towers Rising (2009) and Tara's Dream (2010). 23 minutes in length. and $30 per copy (shipping included) for overseas (PAL version available on request). You can order one by emailing me at pjenkins@interlog.com. It's the first dvd in a series of 5 dvds of my animation and documentary film work that I'll be releasing in the coming months. 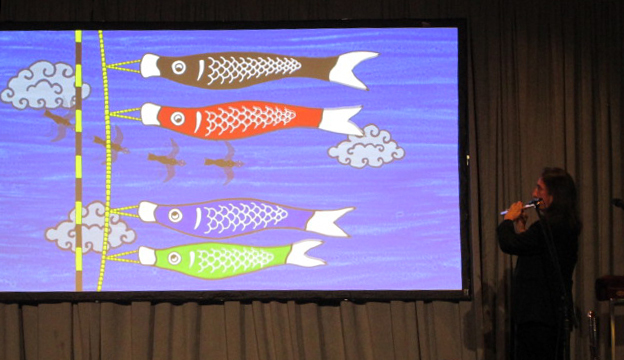 I attended the 2012 London International Animation Festival in England as a guest filmmaker, from Oct. 25 to Nov. 4, 2012. My film "Sorceress" had it's European premiere at the festival in International Programme 3, on Saturday, Oct. 27, 2012 at 4 p.m. 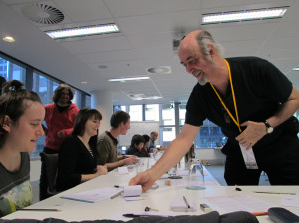 While I was there I conducted 4 flip books workshops, judged the Abstract Film category, introduced my film "Sorceress", judged the Flipbook Challenge competition and spoke on a panel called on the Animated Documentary. It was great to be so engaged during the festival. I really like doing presentations. 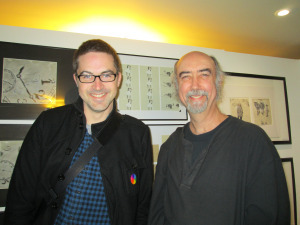 Above: L to R: Tony Comley (British Animator). Tony and I judged the Abstract Film Category of LIAF. 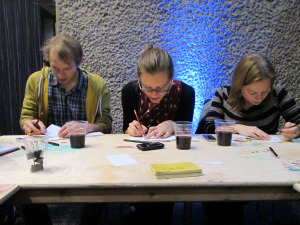 Center is a photo taken during the Spooky Flip Book Workshop I conducted on Halloween Night at the Barbican. 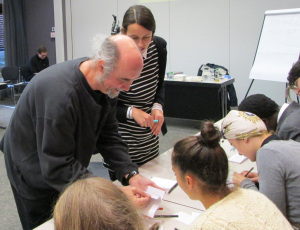 On the left is Urte Budinate (Lithuanian Animator) and me conducting another Flip Book Workshop for the Flipbook Challenge Competition. "I've always liked Patrick Jenkins' films. There's a kind of very hands-on honesty to the visuality of much of his work. His films transmit that sense of directness and it is easy to see the marks left by his brushes. His latest film, "Sorceress", sees him working in the paint-on-glass technique that he has previously employed so lavishly in films such as "Inner View" (2009) and "Labyrinth" (2008). Another very big tick in Jenkins' love of telling a good story and his ability to pull it off with such style and clarity." Thanks again to the LIAF staff. It was a blast! "Sorceress" has been selected has been selected to be shown in the Canadian panorama section of the Montreal based animation festival, LES SOMMETS DU CINEMA D'ANIMATION which runs from November 28 to December 2, 2012. I screened and discussed the creation of my film "Sorceress" (2012), a mythological adventure story. 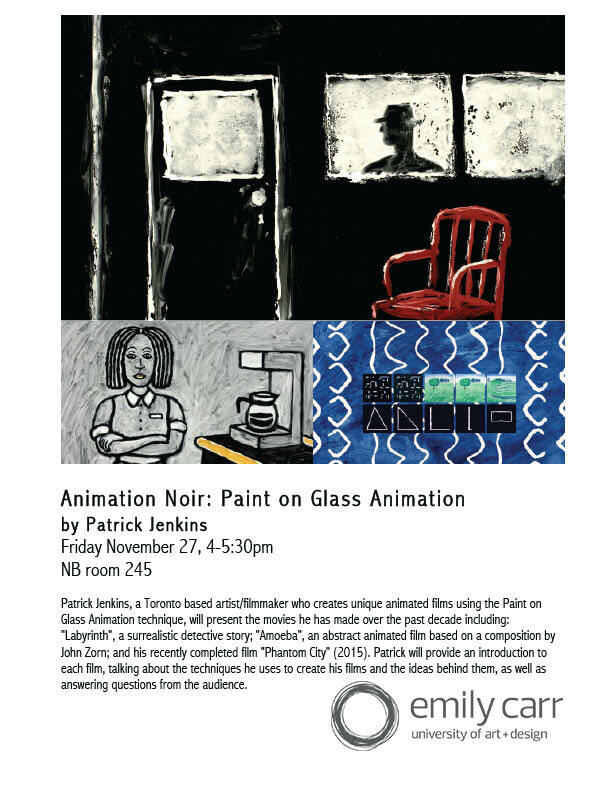 I showed storyboards from the film and discussed my paint on glass animation techniques. I also presented my new flip book, "Morphing City Hall" (2012), launched my DVD "Animation Noir: Films By Patrick Jenkins" and lead a short flip book workshop. 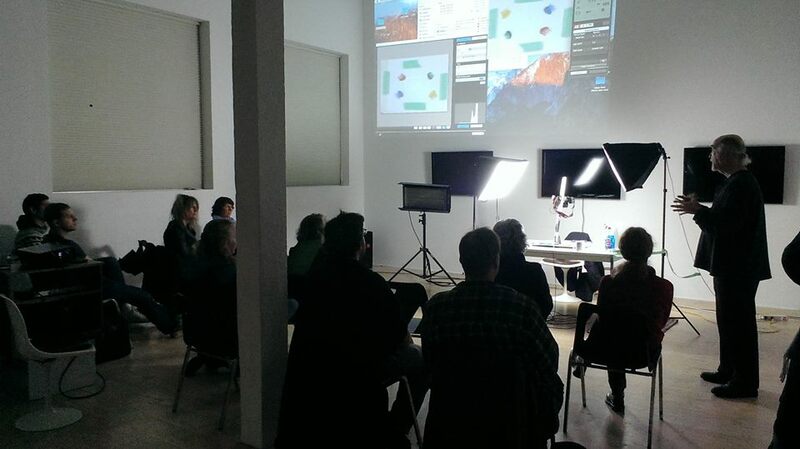 Thanks to the Toronto Animated Image Society for hosting this event and the great audience. Here's a video of me demonstrating the paint on glass animation technique. It was shot and edited by Grayden Laing at Canadian Animation Blogspot. 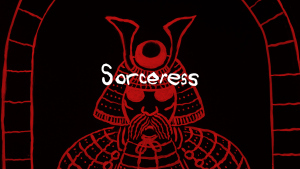 You can see the trailer for my recent film "Sorceress" here. I'm pleased to announce that I'm going to attend the 2012 London International Animation Festival in England where my film "Sorceress" will have it's European premiere. The Festival runs from Oct. 25 to Nov. 4. In addition to the premiere, I will be conducting an animation workshop and speaking on a panel about animated documentaries. It's great to be invited to the Festival and I have to say a big thank you to LIAF and its sister festival the Melbourne International Animation Festival for supporting and screening my films over the years. 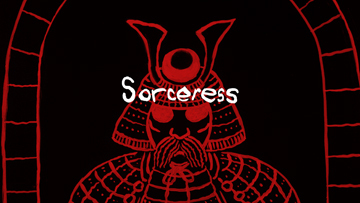 "Sorceress" is a 9 minute, paint on glass animated, mythological adventure film. It took over 12 months to animate and I'm really pleased with how it turned out. A big thanks must go to the Canada Council for the Arts, Media Arts Section for funding the film. You can see the trailer for "Sorceress" here. 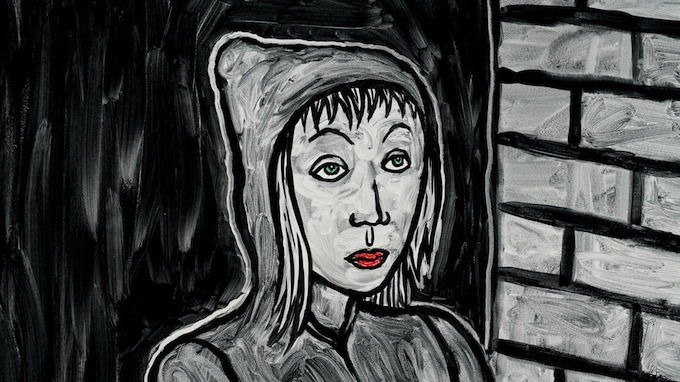 Prior to this "Sorceress" has screened at the 2012 Be Film Underground Film Festival in New York City, the 2012 Toronto Animated Image Society Showcase in Toronto, and the 2012 Melbourne International Animation Festival. I created a new flip book as part of Flip-Toronto. Eight artists chose sites around Toronto and made flip books about them. The flip books were shown on the TTC Subway Video Screens from August 4 to 19, 2012. I chose Toronto City Hall. Click play on the image above to see the book come to life. Wed. Aug. 8, 2012: I'm pleased to announce that my "Morphing City Hall" flip book has been acquired by Special Collections at the Toronto Reference Library. They have an extensive collection of artists' books. Thurs. Aug. 9, 2012: This morning I was delighted to discover that there's an article on Flip-Toronto and my book "Morphing City Hall" in the The Grid Newspaper (Aug. 9 to 15). Here's the online version. There's an article on the Flip-Toronto project in the July 30, 2012 edition of the Toronto Star Newspaper. See it here. Clips From Six of my animated films are now up on Vimeo. Check them out! 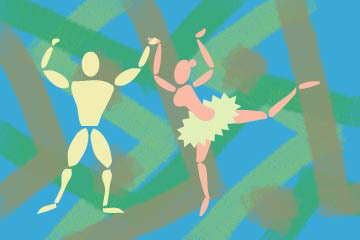 and the London International Animation Festival 2012 in the U.K.
February 2012: I've just finished my new film Sorceress. 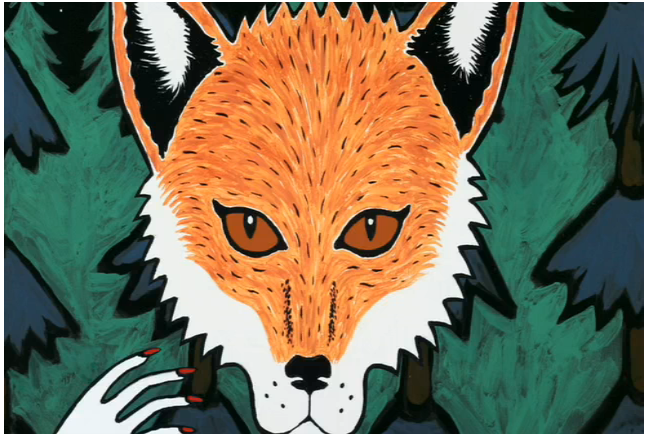 It's a nine minute, mythological adventure story created with paint on glass animation. Synopsis: Two sisters head to the big city to see a concert. When the younger sister is kidnapped, the older sister embarks on a perilous journey to rescue her sibling from a wicked Sorceress. Music by Paul Intson and Sound Effects by Urban Post Production. Thanks to the Canada Council for the Arts for funding this film. My film Tara's Dream has been selected for the Super-Short Competition in Festival MONSTRA, an animation festival in Lisboa Portugal, which runs from March 19 to 25, 2012. In Dec. 2011 I had a short animated loop called Babel Tower (sketch) in TPW Gallery's Photorama exhibition and fundraising show. 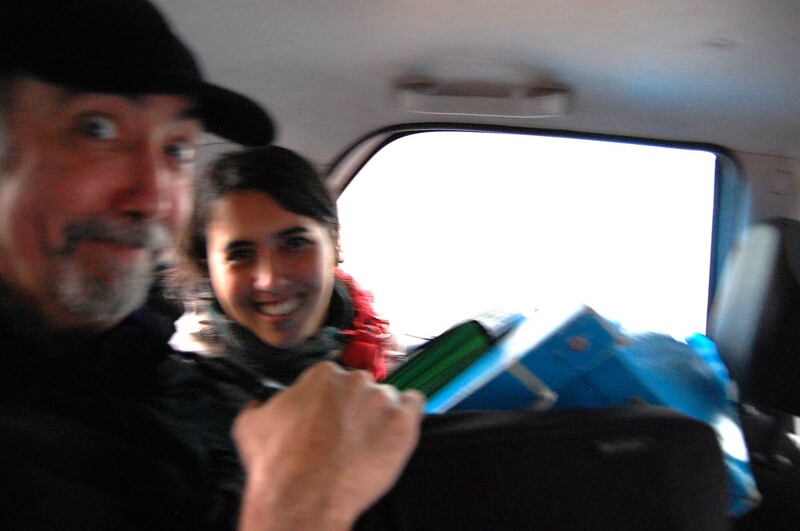 From October 5 to October 8, 2011, I was a guest filmmaker at ANIMA VI International Animation Festival of Cordoba in Argentina, along with Madi Piller and Richard Reeves. My 2010 short animated film "Amoeba" was shown in the Themes and Rhythms Category (International Competition); my film "Inner View" was shown, along with other films from the Eleven In Motion project; and I conducted a paint on glass animation workshop (see below). 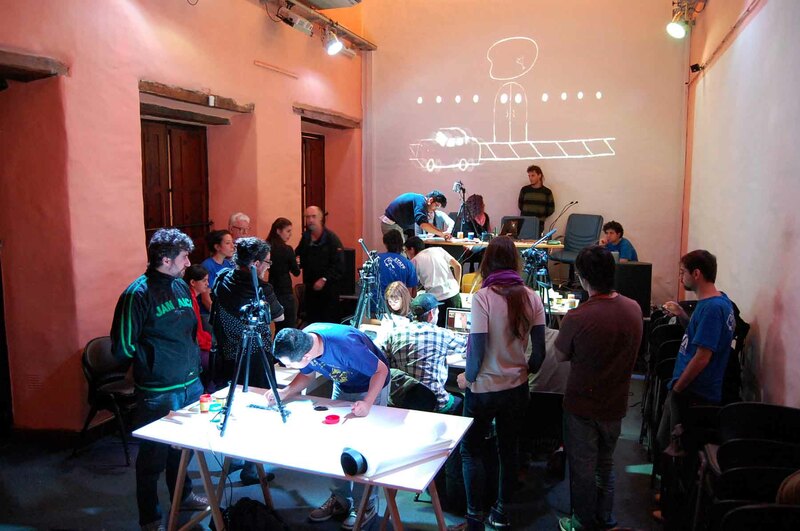 That's my film "Labyrinth" showing on the wall behind the workshop participants. After the festival I went to Buenos Aires for 4 days after the Festival to see that wonderful city. Thanks to Hugo Ares and Madi Piller and all the staff at ANIMA VI for arranging this trip. Photos courtesy of Richard Reeves. I was a guest on Framelines, an online movie program at www.ckln.fm, on Thursday, June 16 to discuss the TAIS Showcase 2011 and my film Tara's Dream. "As a kid, I drew hockey games, airplanes, PT boats, obsessively drawing the same things over and over. I do animation using a technique called paint-on-glass, which is making a painting, taking a shot of it with a digital still camera and then changing the picture a little bit and doing this process again and again. I make up the story and everything; I'm a one-person operation. When you finish an animated film - at least with drawing - you have all this artwork left over, and I wondered what to do with it. I thought about flip books and put together my own flip book publishing business. Over the years, I sold about 90,000 of them! You have to have a lot of patience to be an animator. Every technique is laborious. It's also physically challenging. A lot of times you're standing or sitting in the same position, so your neck and shoulders seize." PATRICK JENKINS independent animator and filmmaker. He studied art at York University. His most recent film is Labyrinth. 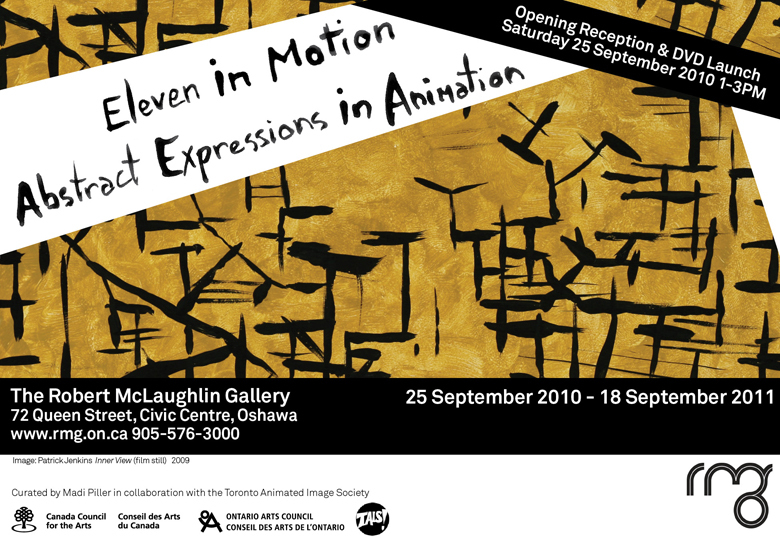 My film "Inner View" was screened at the Ottawa 2010 International Animation Festival from October 20-24, 2010. This film is a homage to the art of Kazuo Nakamura and was made as part of the Toronto Animated Image Society's Eleven in Motion project. My film Inner View was shown in the year long visual art exhibition "Painter Eleven In Motion" at Robert McLaughlin Gallery, 72 Queen Street, Civic Centre, Oshawa, Ontario. Animated films from the Toronto Animated Image Society's Eleven in Motion project were shown along with original paintings by the Painters Eleven. Tara's Dream wins two awards at the Toronto Urban Film Festival! 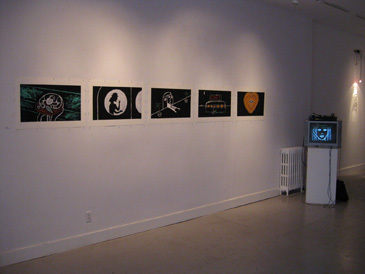 From Aug. 11 to 22, 2010 I exhibited movies and stills at Loop Gallery in Toronto in the group exhibition "Faithful and Faithless Messengers". I showed my films "Labyrinth" and "Towers Rising" along with giclee prints of stills from these movies. 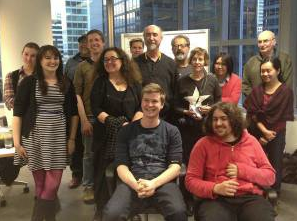 New Film Amoeba wins award! 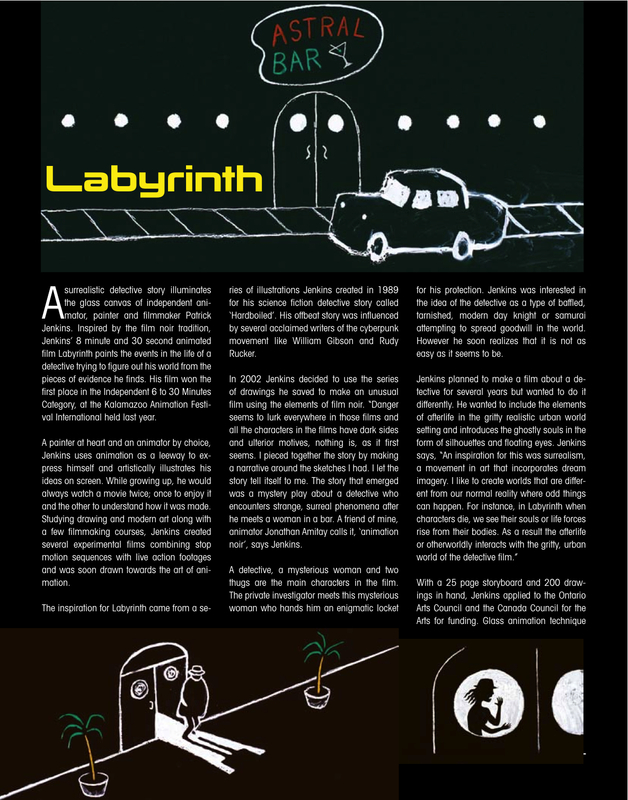 -Here's a feature article on my film "Labyrinth" appears in the current issue of Animation Reporter Magazine (April 2010). The two page article outlines the making of the movie, illustrated with colour stills from the film. Animation Reporter is an English language animation trade magazine, based in Mumbai, India. -My film Labyrinth won Third Place in the Animation Category at BEFILM, the Underground Film Festival in New York City on Saturday, May 1, 2010. -My animated film "Inner View", based on the art of Kazuo Nakamura, was selected for the Films for Children Competition program of 20th World Festival of Animated Film- Animafest Zagreb. The festival was held in Zagreb, Croatia, from 1-6 June 2010. 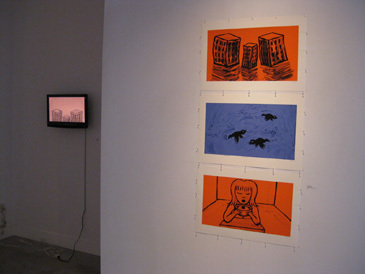 -Labyrinth was shown at Artspace Gallery in Peterborough, Ontario as a continuous loop projection in the Project Room from March 12 to April 24, 2010. -My film Labyrinth has been chosen for inclusion in the compilation dvd "The Best of the London International Animation Festival 2009". The dvd will include 15 films selected from 360 films screened at the festival this year. Two events related to my new film "Inner View"
On November 18, 2009 from 6 to 9 p.m., the "Eleven in Motion" Project opened at the Christopher Cutts Gallery, 21 Morrow Avenue, Toronto; along with original paintings from the Painters Eleven and everyone is welcome to attend. The films were shown continuously on monitors in the gallery. 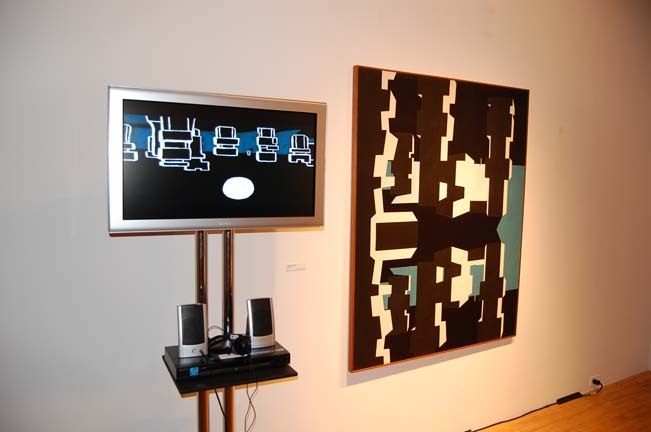 Here is a photo of the installation with "Inner View" playing on the television monitor next to a painting by Kazuo Nakamura. The show ran from November 18 to 25, 2009. Thanks to filmmaker Richard Reeves for the installation photo. My new film "Inner View" is a 35mm, two minute, animated homage to the art of Canadian artist Kazuo Nakamura done using the paint on glass animation. I've admired Kazuo Nakamura's art for over 35 years. In this movie I have attempted to recreate Nakamura's work by animating a selection of his paintings and sculptures as if they are being created in front of our eyes, like constantly growing and evolving plants. 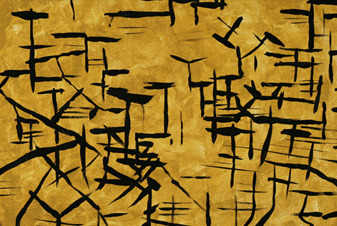 Nakamura's art has its roots in the visual patterns found in nature. His keen interest in science and mathematics was a way of rediscovering the structure of our world. It has been a joy to make a film honouring his work.The music score was written and performed by Paul Intson who composed the music for my previous films "Labyrinth" and "The Skateboarder", with flute improvisation by Ron Korb. 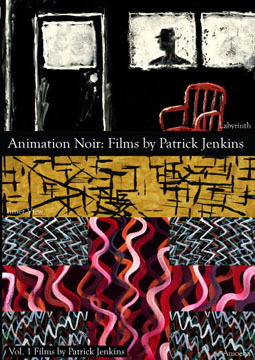 This film was commissioned by the Toronto Animated Image Society for their "Eleven In Motion: Abstract Expressions in Animation" project, a series of 11 films created by animators based on the art of the Painters Eleven, who were abstract expressionists active in Toronto in the late 50's and 60's. Funding for this project was provided by the Canada Council For The Arts and Petman Foundation. It was also shown in December 2009 at Les Sommets du Cinema D'animation, Cinematheque Quebecoise, Montreal. My new film "Inner View" premiered on November 11 at 8 p.m. at TIFF Cinematheque at the Art Gallery of Ontario, 317 Dundas Street West in Toronto to a sold out theatre. Thanks to Madi Piller, Tara Schorr, the Toronto Animated Image Society, The Canada Council for the Arts and the Petman Foundation. My documentary on Canadian sculptor Mark Adair was shown in an exhibition of his art at the Woodstock Art Gallery from October 10 to November 28, 2009 in Woodstock, Ontario. Labyrinth wins award at KAFI 2009!!! My film " Labyrinth " won 1st place in the KAFI 2009 Independent 6 to 30 Minutes Category at the recent Kalamazoo Animation Festival International. My film "Labyrinth", is an 8.5 minute animated film. "After being given an enigmatic locket to protect, a detective encounters strange phenomena and beings from the afterlife in this surrealistic film noir story." Labryinth was done using the paint on glass animation technique and has been shown at festivals around the world. -In Official Selection at the 18th World Festival of Animated Film Animafest, in Zagreb, Croatia, from May 31st to June 5th, 2008. The film was screened as part of the grand Section. -In Competition at the Odense International Film Festival in Odense, Denmark in August 2008. -In July 2008, at the Anima Mundi Animation Festival in Rio de Janeiro and Sao Paulo, Brazil. -In August 2008 at the Montreal World Film Festival, Montreal, Quebec, Canada. 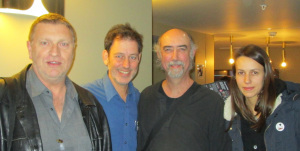 -In September 2008 at the Ottawa International Animation Festival, Ottawa, Ontario, Canada. -In March 2009 at the Philadelphia Film Festival/Cinefest, Philadelphia, U.S.A.
-In May 2009 as a Finalist at KAFI, Kalamazoo Animation Festival International, Kalamazoo, U.S.A.
Patrick Jenkins enigmatic short animated film Labyrinth premiered in June 2008 as an Official Selection of Animafest, the 18th World Festival of Animated Film in Zagreb, Croatia. Since then it's been shown at Festivals around the world and won 1st place, in the Independent, 6 to 30 Minutes Category, at the Kalamazoo Animation Festival International 2009. Q: Can you describe the plot of Labyrinth? A: It's a surrealistic detective story. The synopsis goes: "After being given an enigmatic locket to protect, a detective encounters strange phenomena and beings from the afterlife in this surrealistic film noir story". Q: How did you get the idea for Labyrinth? A: Labyrinth has its roots in a short story that I was trying to write around 1989 called "Hardboiled". It was about a detective who was an android. I was very much influenced at that time by the cyberpunk movement in writing: authors like William Gibson and Rudy Rucker and others. It was intended to be an illustrated story and I did a series of drawings of the detective and the city he worked in. For a number of reasons I never finished the story but I did have a lot of drawings. About 13 years later, in 2002, I dusted off those drawings and saw them in a different light. They became the inspiration for Labyrinth. Q: Obviously Labyrinth follows in the tradition of film noir and the detective thriller, authors like Raymond Chandler and Dashiell Hammett. A: We'll I've always loved the world of film noir for its gritty, urban look that has both a slightly romantic and dangerous feel at the same time. I like that there's moral ambiguity in those films and novels. All the characters seem to have sinister, hidden agendas. People, who initially seem normal, can sometimes turn out at the end of those films, to be very evil. Q: But Labyrinth is not simply a straight up, normal film noir tale? I'm curious about the choices we make in life. Sometimes we make decisions without knowing if they're the right ones or if we've correctly understood all the information upon which they're based. Yet all our decisions have repercussions, for better or worse. The detective faces this conundrum in the film. He barely understands what's going on and yet he pushes on, trying to do the right thing. I was also interested in using film noir because it's a genre that we recognize immediately. We say, "Oh it's a detective film." once we see the private investigator and the grimy city at night. That was important because I wanted to introduce elements of the afterlife or the otherworldly into this gritty, so-called 'realistic' urban world. Q: Where did you get that idea? A: Well actually I was influenced by a lot of writers who had a different take on the detective story. In my early twenties I read a lot of Jorge Luis Borges metaphysical detective stories and later the ideas of William Burroughs. I also really enjoy the writings of Frederic Brown, Marc Behm and Delacorta, all who seemed to be playing with the notion of the crime thriller. About 25 years ago I started really getting into Paul Auster's novels, especially his New York trilogy, which were self-reflective detective stories where the detective gets completely lost in his investigation, he can't figure anything out and a result he loses a sense of his self. A lot of that seeped into Labyrinth. Q: Labyrinth is an intriguing title, but there's no actual labyrinth in the film? A: That's right. I liked the sound of the word labyrinth. It had a very evocative feel. It's really a metaphor for the puzzling world the detective encounters in the film, the story as a maze. Q: In a classic film noir way, the detective meets a mysterious woman in a bar, who gives him a pendant and runs off. What does she represent to you? When he meets this mysterious woman, she's on the run from two pursuing characters so we know she's got to be involved in something shady. She ducks into a bar to evade her pursuers and even though she doesn't know him, walks up to detective and hands him the pendant to protect and kisses him. I'm interested in how sometimes men and women can be attracted to and trust each other in a very short space of time, even though they don't know anything about each other. He hasn't a clue who she is or what she's up to, yet he takes the pendant from her for safekeeping. Q: It seems like quite a big leap from your previous animated film "The Skateboarder" to "Labyrinth". A: It does on the surface, but actually there's a link between many of my films from "The Goatee Club" (1999) which was based on a poem by Ralph Alfonso about a first time poet encountering the strange individuals at an open mike poetry reading; to "Man Versus Geometry" (2004) where a stick figure wrestles with a half circle; to "The Skateboarder" (2005) where the skater boy finds more than he bargained for in a construction site. That theme is the individual coming to grips with his environment, so in that sense Labyrinth is not that big a leap. Also shadows continue to play a huge role in my films. "The Skateboarder" was basically a shadow play and many of the characters in Labyrinth first appear as shadows behind frosted glass. 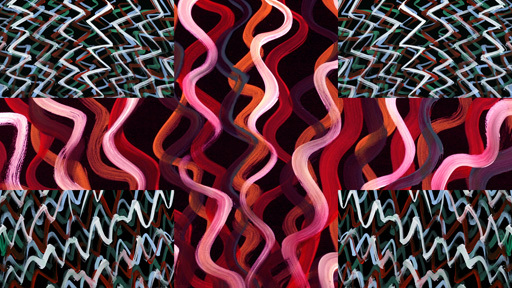 Q: Yet Labyrinth seems to be more about art and deeper ideas or themes? Would I be right in saying that? Also I'm interested in the notion that there may be more behind reality. I like to imagine that more is possible than what seems to occur in our everyday life. In some ways this is fantasy or a notion of other worlds. The ideas of the writer Alfred Jarry (1873-1907) inspired me. Jarry was a huge influence on the Dada and Surrealist art movements. Jarry's philosophy, "Pataphysics", suggested an imaginary realm beyond our senses. His philosophy suggested another universe parallel to our universe, where anything is possible. This inspired me in developing the story for Labyrinth, where odd phenomena occur and figures from the afterlife interact with everyday reality. As an artist, I like to imagine what the world could be, rather than just replicate perceived reality. 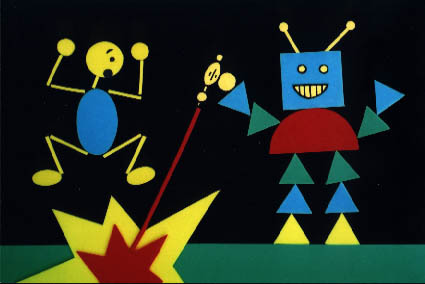 A: Yes several years ago I got interested in paint on glass animation which is an experimental animation technique where you create a painting under the animation camera, take a picture with the animation camera and then alter the painting and repeat the process. No art exists at the end of the film, just the digital pictures that make up the frames of the film. I became interested in taking animation in a different direction away from the 'cartoony' look most associated with it. I had initially wanted to be a painter when I went to art school 30+ years ago and I still really enjoy painting. 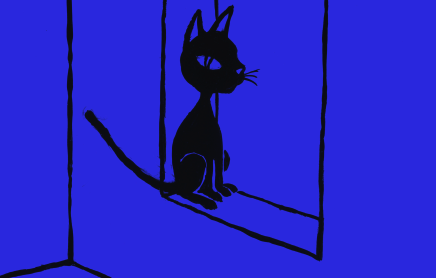 I started to do tests with paint on glass animation and found that I really liked it. It was great to work tactilely with real paint. Previously I had been creating work with cut-outs in the computer, which for me is not as gratifying a process. It was great to be able to manipulate real paint under the camera. Q: The ending is very ambiguous with the shadows of birds flying away. Can you talk about that? A: The birds at the end are, for me, simply a poetic image. They're not intended to make a specific point. In fact I intended them to be mildly puzzling. The film for me is a meditation on the transient nature of life and I think the birds, for me have that fleeting quality. Also when people die in the film, we see their life force or souls leave their bodies, so the birds seem to echo that for me. 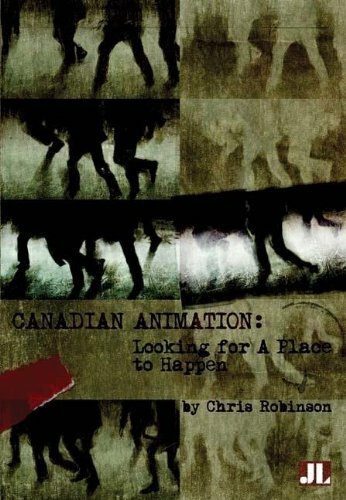 For everyone interested in Canadian Independent Animation, I thought that I would let you know about the book "Canadian Animation: Looking for a Place to Happen" by Chris Robinson (2008). 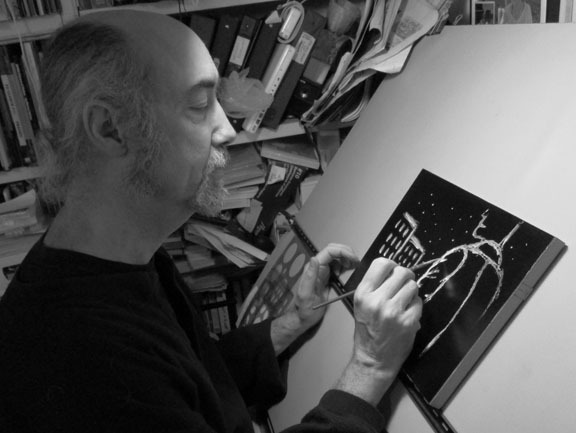 It's composed of a series of interviews he conducted across Canada with independent animators. I am pleased to have been included in this book. 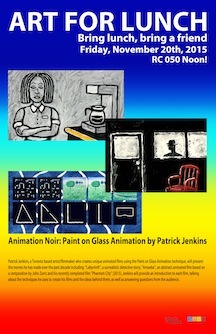 A paint on glass animated film. Synopsis: After being given an enigmatic locket to protect, a detective encounters strange phenomena and beings from the afterlife in this surrealistic film noir story. can now be seen on BRAVO! television. Check your local listings for broadcast dates. 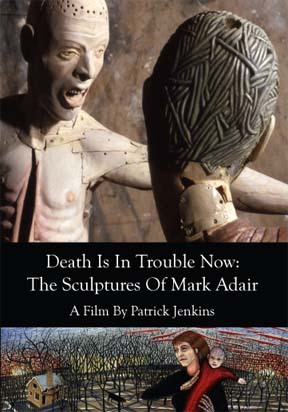 "Death Is In Trouble Now", is a documentary portrait of Canadian artist Mark Adair. An environmentalist, Adair's Gothic style sculptures comment on contemporary man's relationship to the natural environment and the stress of urban life. His sculptures explore such diverse subjects such as violence, sexual politics between men and women, pollution, spirituality, consumerism and the devastating force of nature. 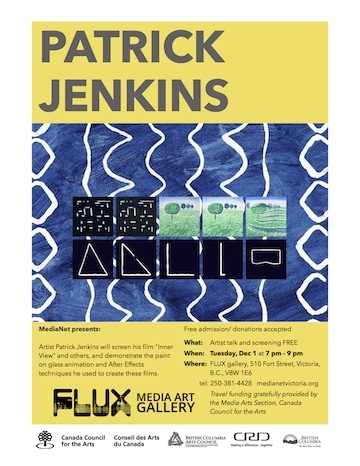 His art has been exhibited at the Community Gallery, Harbourfront Centre, Toronto; Optica Gallery, Montreal and Loop Gallery, Toronto; and is in the collection of the Canada Council Art Bank. This documentary explores the artwork Adair has created over the past 25 years and traces the themes in his work to his childhood experiences of growing up in the country and seeing noticeable environmental degradation in his lifetime. I am also curating a retrospective gallery show of Mark Adair's artwork that will be shown at the Rodman Hall Arts Centre in St. Catharines, Ontario, Canada from July 8 - September 16, 2007. 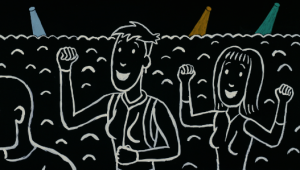 The opening is on Sunday July 8 at 2:30 p.m.
"Of Lines and Men", is a documentary portrait of Canadian Independent Animator Jonathan Amitay who has created innovative stop motion animated films using thin gold chains and sand. 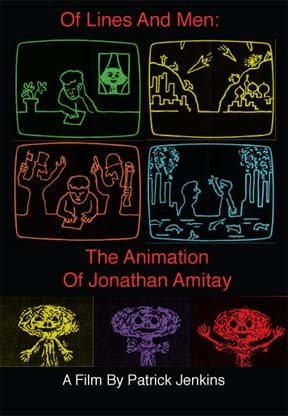 Amitay's award winning films about ecology, nuclear war and human rights, have been screened at film festivals around the world and have been honoured with retrospective screenings at Cinematheque Ontario and the Ottawa International Animation Festival. This documentary explores Amitay's films and traces the themes in his work to his childhood in Palestine during the Second World War. My film "The Skateboarder" was chosen as a finalist at KAFI, the Kalamazoo Animation Festival International in Kalamazoo Michigan. The Festival took place in May 2007. "The Skateboarder" was shown at the prestigious Annecy 2006 International Animation Festival in Annecy, France from June 5th to 10th, 2006. This is a short 2-D computer animated film about a boy who, despite warning signs, goes skateboarding in a construction site with disastrous results. "The Skateboarder" had its Toronto Premiere at the Canadian Filmmakers Festival on Saturday March 25th, 2006 at the Cineplex Odeon Carlton Cinemas. "The Skateboarder" was shown at the Real 2 Reel Children's Festival in Vancouver Tuesday, February 28, 2006 and is also being screened at Cinematheque Quebecoise in Montreal on March 30, 2006. It premiered at the 2005 Montreal World Film Festival which ran from August 26th to September 5, 2005 and at the 2005 Ottawa International Animation Festival on Sunday, September 25th, 2005. Patrick Jenkins highly energetic short animated film "The Skateboarder" premiered recently at the 2005 Montreal World Film Festival, and the 2005 Ottawa International Animation Festival. In 2006 it was screened at the prestigious Annecy International Animation Festival in Annecy, France; Cinematheque Quebecoise in Montreal; the Reel 2 Real International Film Festival for Youth in Vancouver and The Canadian Filmmakers Film Festival in Toronto. Q: Can you describe the plot of The Skateboarder? A: Despite warning signs, a boy goes skateboarding in a construction site, with disastrous results. He pulls a lever that activates the construction machinery of the site. One of the pieces of equipment, a Steam Shovel, comes alive and tries to wipe him out. There's something not quite right about this construction site as eventually a huge devil like creature emerges from the ground. Q: What was the Skateboarder film about for you? A: Pure kinetics (laughs) and a pure delight in motion! I wanted to work on a film that was about action. After all that's one of the things that's enjoyable about animation, a story told through movement. Q: How did you get the idea of doing it on a Skateboarder? A: Well I had done a flipbook about a skateboarder many years ago. Skateboarding seemed like a kinetic activity that would look great in an animated film. Funny thing though, as I started to casually research skateboarding, I realized that skateboarders are really held done by gravity (laughs). I mean these guys and girls can do great things but they can't defy the laws of physics (laughs). At least not yet! Sure they can make short jumps and leaps and rolls where they seem to defy gravity but generally I was a bit disappointed about how gravity always seems to triumph. So when I animated the flipbook I used my imagination and had the skater do complete 360-degree flips and rolls that no regular boarder could and that carried on into the film version. Q: How did the story of the Skateboarder develop? A: Well stories for me develop from a set of visual images that I'm interested in. I did a series of drawings of the Skateboarder in different environments and situations and developed the story from those key images. An image or two would come to me, pop into my mind and I become intrigued by them. Then the challenge is to find a story or world or context in which these images make sense. It's funny because in painting you can paint the moment and let is sit there as an isolated image that we can contemplate. Film on the other hand is a flow of images that interact with each other and the challenge is to find a way of getting viewers into a world where they can entertain and draw meaning from bizarre or different images. It's like saying to an audience, for a moment, just imagine that this is possible. When it works, it's magical. Q: What audience did you have in mind for the film? A: I like to think audiences of all ages could enjoy it. It's been called a film for kids but that's not how it started. Coming from painting and drawing, I tend to develop a film from a series of images that intrigued me. In this film I was interested in a very graphic style of representing objects. The imagery is pared down to a shadow play. I wanted to combine this very graphic look with a very kinetic story. Q: What animation technique did you use? A: Well the project originally was designed as a classically animated film, doing drawings on paper by hand, then transferring them to cels and painting them and filming them. I had originally wanted a project where I could really explore realistic movement. When I got the Mac I decided to make it with digital cut outs created and animated in the computer. It was a real job to get the realistic motion that I wanted with digital cut outs. Q: What about digital ink and paint? W: Well that was still in its infancy when I started making the film. The way things developed technologically over the 13 years I was thinking about the project (laughs), I probably should have stuck to my guns and done it on paper. Q: So you finally got started in 1998? A: Yeah, August 1998 at the cottage (laughs). You know, nice summer weather and I'm indoors staring at a computer screen, sheesh. I worked at it in fits and starts, over the next six and a half years. I started at the beginning of the story and worked my way more or less in a straight line to the end. Q: Were you working at it consistently? A: Oh hell no. You're heard of low budget filmmaking? Well I was doing no budget filmmaking (laughs). The problem with doing a film with no money is that it is spiritually very challenging to drag yourself through the process of making the film. I would work feverishly for several weeks on it and then either something would distract me, like a commercial job or teaching and that would derail the momentum. Also I resist sitting, staring at a computer screen for hours and hours on end. It drives me crazy sometimes. I feel cut off from my body. I love to draw and paint on paper or canvas and here I had to draw into the computer, which I hate. It's a miracle I made it through the process (laughs). Q: So you'd have to put it aside for a while? A: Yeah, also other projects came and went. I did a half hour documentary on a poet called "Ralph: Coffee, Jazz and Poetry" that had four animated cut out films in it illustrating his poems. They were a lot less taxing to do, as the animation wasn't so exacting. Also I did a few commercial jobs. 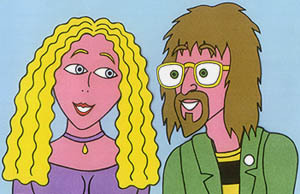 One was an animated children's music video and an animated video of the song "Dancing Street" by the band Katrina and the Waves. In the midst of that I was doing teaching and some administrative work as well. Q: Did you do the sound work on the film yourself? A: Yeah, I got out the pots and pans and started banging away. Most of the sound effects in the film are done that way. I much prefer "live" sound effects whenever possible as opposed to canned sound effects off a CD. There's more of a punch to the sound. Q: The graphic, high contrast look of the Skateboarder is very distinctive. It reminds me of Lotte Reiniger's animated silhouette puppet films. Where did you come up with that? A: Well in the early eighties, twenty years ago, I was making experimental shadow films where I would film shadows projected on tracing paper. Someone said it was like the myth of Plato's cave where we see life as a series of shadow projections, rather than the real thing. I've loved shadow imagery and certainly Balinese Shadow Puppetry and Reiniger's work were a big influence. A shadow is interesting as it's a projection of ourselves on the world. When I designed the Skateboarder it was just a given that he would be a black silhouette. Maybe that's my resistance to making things look normal. In my films I'm fascinated as much by the material that is making up the image as I am by the image that is created. In the case of the Skateboarder he's made up of a bunch of geometry, an ellipse for a head, a line for the beak of his hat, etc. I like that basic construction, as it looks different from what we are used to. It portrays a world through the simplest possible shapes. I was interested in how few lines and shapes you could use and still have a recognizable image of say a steam whistle or a skateboard. Q: Wasn't your previous film, "Man Versus Geometry", based on a similar thing? A: Exactly. In that film, which was a stop motion film make up of geometric shapes, the main character literally falls to pieces in a pile on the floor. 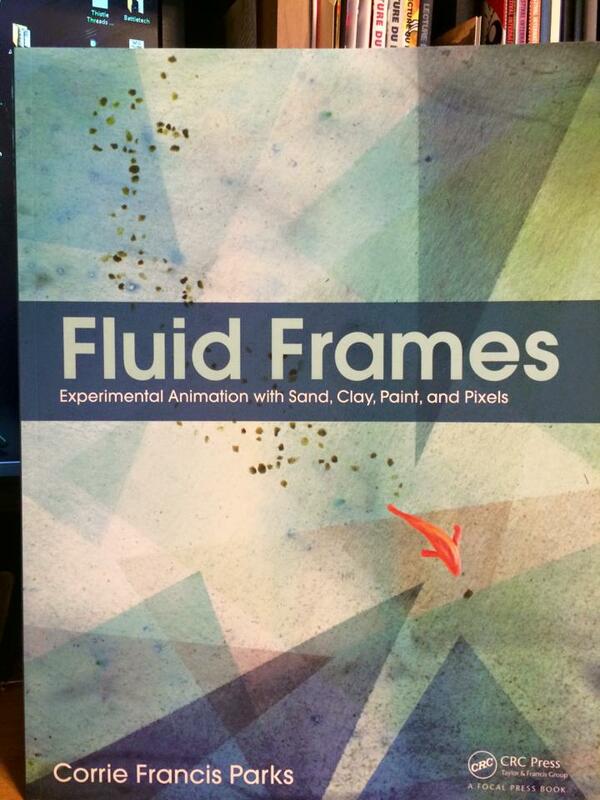 A lot of this interest in the basics of the animation medium comes from my training as a painter and visual artist. In my paintings, I'm as equally interested in the paint that makes up the image as I am in the image. The paint takes on a sculptural quality. Art is a con, a construction, a trick designed to let us see something different. I feel better when I'm acknowledging the materials that make up the illusion of art. Q: Well obviously the Skateboarder was important for you to do if you spent that long on it. A: Yeah, maybe an unhealthy obsession (laughs). You know, there's a large part of me that is young at heart and needs to express exuberance and energy and I think that's what the Skateboarder is about. I mean look at the way we live. It feels so constricted at times. Don't make too much noise. Don't be rude. Shut up and behave. It wasn't that I wanted to be rude but movement is very important to me. We're kind of restricted in modern society. There's no nature left to explore so the boy in the Skateboarder goes exploring in what is left to him, a construction site. As a kid, I can remember playing in the few fields that developers hadn't turned into housing projects. Eventually they were all turned into subdivisions. The skateboarder is doing what every boy would do, explore his environment and test his physical limits in it. Now this may seem like an awfully deep interpretation of what is basically an action cartoon, but remember, we are creatures of nature. Our bodies are designed for movement and we get quite sick when we are denied movement. Baby animals play with each other just like humans, in order to understand their physical selves and environment, even though it's dangerous. A predator could kill them while they are playing. Play is a way of understanding your body's relationship to the environment. Young men would go out with their fathers and hunt and learn how to work with their environment. In our world exploration has become internalized and ritualized. We're either exploring our subconscious or going on safaris and hikes into what is left of the natural world (laughs). Q: So he's doing what comes naturally to boys? A: Right. Boys don't mean to get into trouble. They just do that naturally in an attempt to learn about their bodies and their environment. They can't help it (laughs). Q: He activates the machinery of the construction site but you go beyond that to have a Steam Shovel monster come to life and menace him. A: Well, I'm a real believer in 'what if'. What if a steam shovel monster could come alive? What if a huge devil like character lived under the construction site? I guess I live in a fantasy world (laughs) but that's what intrigues me. I love; for instance, the way Rene Magritte would paint unlikely situations, like a giant green apple filling up a room. I like imagining 'what if'. Again it goes back to the deceptive nature of the world. How what you see is not what you get. Q: At the end he gives up on skating in the site. Is there a moral here? A: Well if there is a moral, it's totally baffling. I don't think the boy's learned much (laughs) except maybe to avoid that particular construction site (laughs). Often times in life you find that you have to be careful or stay away from certain experiences but I didn't want to say something as lame as "Don't go skating in construction sites". That's not the point. It's more of a spoof. It's more about the boy encountering a weird environment and possibly not learning anything from his catastrophic experiences. Q: The Skateboarder seems to rebel against the signs that warn him. A: Well, yes he does. I guess we have to ignore the warning signs sometimes and just plunge into the experience (laughs) regardless. I guess you could look at the film as a morality tale of sorts, about how we ignore our subconscious at our own peril. I sort of see those signs in several ways. First, obviously they are cautioning him about the dangers inherent in the construction site. They're saying, "You could be seriously injured. Stay out!" (laughs) That's the most obvious reading. Stay out! However I'm fascinated by how artificial signs are and how they mark territories. Our world is divided into territories of private property. This is owned by someone, keep out. We're assaulted by signs everywhere telling us to do this and that (laughs). Now this may seem to be a bit deep for what is really a little animated comedy, but the territorial markers are everywhere in our society. So that's one way to interpret those signs. Another way is to look at it as warnings of internal crisis. Watch out, personal demons ahead (laughs)! Q: How do you interpret the demon like figure that emerges from the ground? A: Well obviously that's a bit of just having fun, that 'what if' that I was mentioning earlier. I thought that it would be neat to have things escalate from the skater's trespassing on the construction site to the point where it awakens this demon (laughs). I don't know why exactly. It seemed like a good idea at the time (laughs). Ultimately it's a fantasy. I enjoy sometimes thinking about why I do things but there are always a number of possible interpretations of the film. Q: Technology seems very ominous in the film. A: Yes technology, while it makes life easier, is great until it doesn't work or behave the way we want it to. Then it's a source of stress. Anyone who's fought with an appliance or piece of malfunctioning equipment can attest to that. I remember several summers ago turning my back on a gas barbecue (laughs). When I turned around, these huge flames were lapping around the outside of the barbecue. Somehow I managed to turn it off without burning myself, otherwise, seconds later, it would have set fire to the wood fence behind it! So yeah, you've got to watch technology closely. "Man Versus Geometry" released Jan. 2004. 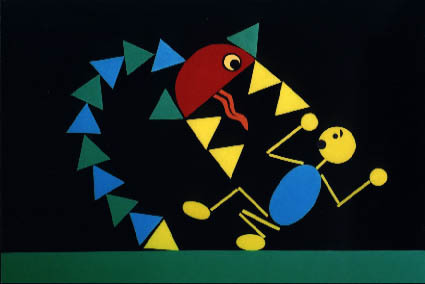 "Man Versus Geometry" is a 2.5 minute stop motion animated film in which a man encounters a treacherous half circle in a battle of wits. 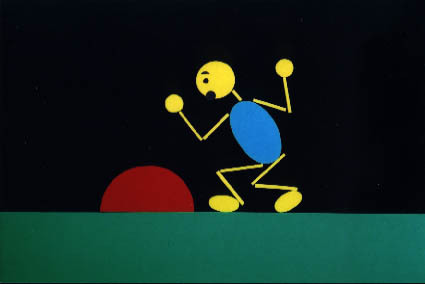 "Man Versus Geometry" was shown at the 2005 Annecy Animation Festival in Annecy, France from June 6 to 11, 2005 in the Independent Canadian Animation Program. To read an article on the Making of Man Versus Geometry, click here. Animated Music Video by Patrick Jenkins of Katrina and the Waves' Song "Dancing Street" from the album "Katrina and the Waves: the original recordings: 1983-1984" issued by BONGOBEAT records (Nov. 2003) 767003198528. 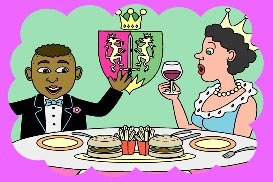 Two versions of this animated video can be found on the bonus DVD included with this CD release as well as stills from the original storyboard. "Ralph: Coffee, Jazz and Poetry; The Poetry of Ralph Alfonso" was broadcast coast to coast on C.B.C. Television's "Canadian Reflections" Show on (St. Patrick's Day) Sunday, March 17, 2002 at 11 p.m. Check local t.v. listings for rebroadcasts. In Fall 2004 it was broadcast on Bravo! Television in Canada. Check your local listings for broadcast dates. "Ralph: Coffee, Jazz and Poetry, The Poetry of Ralph Alfonso"
Ralph Alfonso's poetry is inspired by the Beat writers Allen Ginsberg, Lawrence Ferlinghetti, Gregory Corso, and Jack Kerouac, as well as jazz and rock music. In 1992, he began publishing his poetry 'zine "Ralph", on his antique Gestetner machine. His poems document his life and focus on love, both joyful and bitterweet and memories of places he visits. He gave away these zines through the mail and book and record stores. One of these zines fell into the hands of Peter Gzowski, the host of the national CBC radio show Morningside, who invited Ralph onto the show for a half hour interview. Seizing the moment, Ralph assembled a small musical combo, made up of a guitarist andbongo player, and recited his poetry to jazz flavoured musical accompaniment on the show. The next day Ralph started to receive the first of what would eventually be hundreds of letters from admirers who wanted copies of his zine. Ralph started to issue CD's of his beatnik inspired spoken word performances including: "Coffee, Jazz and Poetry" (1995), "Olympia 66" (1996) and "Sophisticated Boom Boom" (1997) and "This Is For The Night People" (2001). His 'zines have been published in two books and he and his band have toured across Canada on the "Beatnik Folk Pop Explosion Tour" that features poetry and songs that mix the jazz, folk and garage rock musical traditions together. "Ralph: Coffee, Jazz and Poetry" features live performances of Ralph's poetry and songs along with interviews that explore the poetic traditions that have influenced Ralph's poetry and outlook on life. His poems "Venus In Violets", "The Goatee Club", "Crawling Around In A Fountain" and "This Is My Corner Of The World" are brought to life through animation. "Positive, up beat, humanist, good humored, makes ya smile, sincerity of the artist's work yet goofily irreverent, makes ya feel good about art and poetry, cool funny videos, color/b+w variety, good short interviews from pals, mild in its persuasion, gets its message across without hitting ya over the head with it...non threatening for a first time user." "Ralph: Coffee, Jazz and Poetry; The Poetry of Ralph Alfonso" premiered at the 2001 Montreal World Film Festival/Festival Des Films du Monde in the Panorama Canada category (August 27 and 28th) at the Parisien Cinema. "...Ralph is a short but thoroughly loving doc on Montrealer-turned Vancouverite and "crazy cool bongo cat" Ralph Alfonso, who one day realized that he could teach the world to sing if he gave up a graphic design career to set his poetry to nouveau beatnik music...It's all expressed in cartoon illustrations and friendly interviews." A short, computer animated video of poet Ralph Alfonso's poem/song "Crawling Around In A Fountain", directed and animated by Patrick Jenkins for upcoming his documentary "Ralph: Coffee, Jazz and Poetry; The Poetry of Ralph Alfonso". A poet returns to the Trevi Fountain in Rome, to retrieve his penny and try again to make his wishes come true. A short, computer animated music video of Terry Draper's children's song "Can You Pretend? ", from his album "Can You Pretend?". Directed and animated by Patrick Jenkins for Bullseye Records of Canada. A short, computer animated video of poet Ralph Alfonso's poem/song "This is My Corner of the World", directed and animated by Patrick Jenkins for upcoming his documentary "Ralph: Coffee, Jazz and Poetry, The Poetry of Ralph Alfonso". A poet's home is his castle or at least his little corner of the world. 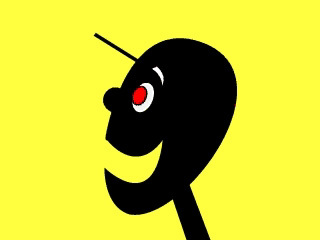 A short, computer animated video of poet Ralph Alfonso's poem/song "The Goatee Club", directed and animated by Patrick Jenkins for upcoming his documentary "Ralph: Coffee, Jazz and Poetry, The Poetry of Ralph Alfonso". A first time poet encounters the bizarre characters of the local poetry scene. A short, cut-out animated music video of poet Ralph Alfonso's song "Venus In Violets", directed and animated by Patrick Jenkins for Bongo Beat Records of Vancouver. 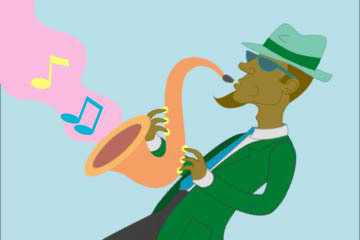 From the CD "Sophisticated Boom, Boom" by Ralph Alfonso. This video is included on this CD as a QuickTime movie. Aired March 1998 on Muchmusic's Indie Spotlight Television Show.